Autism is a complex neurodevelopmental disorder whose causes are not fully understood. 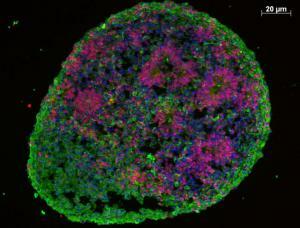 Recent work by scientists at Yale University has shown that organoids – miniature three-dimensional organ buds – grown from stem cells could help shed some light on autism spectrum disorder (ASD). Autism is characterised by inhibited social, cognitive and motor skills, delay or absence of speech, and repetitive stereotypical actions and behaviour. Despite evidence of a strong genetic basis for the disorder, only 10-20% of autism cases have a known genetic cause. It is also difficult to replicate in animal models. Recent work growing organoids has shown great promise, with scientists able to grow and study miniature versions of important organs like the liver, intestine, kidney, thymus, stomach, heart and brain in the lab. In this study, researchers set out to use organoid technology to recreate the development of a part of the brain called the cerebral cortex. To do this they grew cortical neurons, the main type of cell in this part of the brain, using induced pluripotent stem cells (iPS cells) derived from patients with autism and their family members. iPS cells are a type of stem cell with the potential to turn into any type of cell in the body, including brain cells. Skin cell samples from four individuals with autism, and their unaffected fathers, were obtained through the Simons Simplex Collection. The only common feature among these patients was a larger than normal head size. DNA was extracted from the skin cells for genomic sequencing, which showed no strong evidence of mutations in any genes that can be linked to autism. Induced pluripotent stem cells were produced from the skin cells, and then grown in a special cell culture containing factors which encouraged them to turn into a mini organ, or organoid, that contained cortical neurons. This picture shows the difference between ASD neurons and control neurons, where the ASD neurons matured and formed synaspes faster than the controls. When researchers compared the development of the cells from the autistic patients to those of their unaffected parents (who acted as a control) they found a much greater proportion of inhibitory neurons than excitory neurons in the autistic cells, compared to the control cells. There was also much faster growth rate in the autistic cells compared to controls. They then measured the total expression of all genes in both groups. They found that in the autistic cells that there was an over-expression of the genes involved in proliferation and differentiation of neurons. Of all the genes analysed, they found that a gene called FOXG1 showed the most dramatic change in expression between the two groups. Testing the idea that FOXG1 might affect the expression of other genes, they created additional cell lines in which they “corrected” the FOXG1 overexpression found in one of patients’ line using small interfering RNA. They found that correcting FOXG1 over-expression prevented the excess generation of inhibitory cells. This showed that FOXG1 played a role in how these neural stem cells differentiate. Finally they compared clinical data with the gene expression data. There was a strong correlation between expression levels of FOXG1 and the head size and severity of autism among patients. This study is the first to use organoids derived from patients to model autism that has no known genetic cause, and could be scaled up to include more patients for greater statistical analysis and power. Other parts of the brain could be explored and organoids could be a powerful tool to explore other features of autism spectrum disorder, including sensory issues, epilepsy, anxiety and depression. Dedicated autism biobanks, which already exist, could be a source of data and materials for such large scale endeavours. The accelerated growth and skewed ratio of excitory/inhibitory neurons could be a factor that helps predict whether a person could develop autism. Further work on what controls the expression of FOXG1 could be of use, as the causes for the over-expression of this gene are not yet fully known. Finally, other tissues could be grown to examine co-occurring issues related to autism spectrum disorder, such as gut problems and a dysfunctional immune system. Organoids, or even organs on a chip, of various kinds could be made, to explore how they interact in relation to autism. Given the multi-factorial nature of autism, such an approach could be beneficial. This research spotlight is based on: FOXG1-Dependent Dysregulation of GABA/Glutamate Neuron Differentiation in Autism Spectrum Disorders, Mariani J et al. Cell 2015. Flora Vaccarino, the lead author of this paper, was recently interviewed about this work on The Stem Cell Podcast. Thanks to Flora Vaccarino for reviewing this research spotlight, which was written by Jamie Reilly and edited by Kate Doherty. Lead image by Jessica Mariani.